Dessus cest arbre sec ? T. Viateur, je lamente. Dont je meurs de douleur. R. En quelle part est-elle ? Qu’elle ne m’a tuée avecques ma fidelle. R. Voudrois-tu bien mourir et suivre ta compagne ? Où tousjours le regret de sa mort m’accompagne. R. O gentils oiselets que vous estes heureux ! Qui mourez et vivez fideles amoureux. R. Why do you lament? For whom I’m dying of grief. Who didn’t kill me with my love this way. R. But would you truly die and follow your companion? Where grief for her death is my constant companion. R. O pretty birds, how fortunate you are! Who live and die as true lovers. Blanchemain’s version offers a number of small revisions: the turtle-dove’s first reply is “Las ! passant, je lamente” (‘Alas, traveller, I lament‘); and he laments “pour ma compaigne absent / Plus chere que ma vie” (‘For my absent companion / Dearer than my life’). In the second quatrain “nuict et jour je chante / Son trespas dans ces bois” (‘night and day I sing of her death in these woods’). And at the start of the first tercet Ronsard asks “Voudrois-tu bien mourir avecques ta compaigne?” (‘But would you truly die with your companion?‘). However, none of these substantially changes the flavour of the sonnet, which remains a charming example of Ronsard’s faux-naif naturalism. Entre-surpris de joye et de tristesse. Sinon au poinct que l’honneur vous defend. La guarison d’autre part ne depend. Surprised by joy and sadness. Except as far as honour demands. Does not depend on any other. Je suis pour vous, quand à vous je m’adresse. Because of you, when I speak to you. Duquel le souvenir tant seulement me pâme ? Adieu bel oeil divin qui m’englace et m’enflame. Il est temps de partir le jour en est venu. Le besoin importune non le desir me presse. Le pied vous laisse bien, mais le coeur ne vous laisse. Voy-le-là, baisez-moi, gardez-le, et puis adieu. Thinking of which alone makes me faint ? Farewell lovely divine eye which both freezes and burns me. It is time to part, the hour has come. And while my feet may indeed leave you, my heart will not leave. Look at it there, kiss me, watch over it, and so – farewell. For Ronsard, a madrigal is a sonnet with an unusual number of lines – that is, his lines have the same length and are grouped in 4s and 3s as in a sonnet, but he has an extra line or two – or as in this case an extra tercet. Blanchemain however points out that the version with that tercet (the penultimate ‘stanza’) appears only in posthumous editions. Ronsard’s other madrigals in Amours 2 are variously 4+4+4+3; 4+4+3+4; 4+4+3+5; and so on. He doesn’t have a ‘standard’ non-sonnet madrigal form, in other words. Voile-la, baisez-moi maîtresse, et puis adieu. Wrap it up [or, see it there], kiss me mistress, and then farewell. Sans le vostre ou le mien vivre je ne pourrois. J’en jure par vos yeux, quand pour vous je mourrois. ET TRESPASSA SANS COEUR, ET SANS COEUR IL REPOSE. Without yours or mine I could not live. I swear it by your eyes, if I could die for you. AND DIED WITHOUT A HEART, AND RESTS HERE WITHOUT A HEART. Once more a sonnet with substantially different versions. Blanchemain’s version changes 8 of the first 11 lines; only the final tercet remains unchanged. With so much change here is his version complete. Note that, following the last sonnet’s unusual rhyme scheme in the sestet, this version of the poem has a number of unusual enjambements in lines 3-4 and 6-7. Le vostre, car sans coeur vivre je ne pourrois. De perdre un tel amy, à moy grand avantage. Grand honneur et plaisir, quand pour vous je mourrois. Your own, for without a heart I could not live. And honour and pleasure, if I could die for you. Dessus l’espine assis sa complainte amoureuse. Hier au soir de l’eau d’une main si songneuse. Sitting on the tree top, of her lovers’ complaint. Water last night so carefully with your own hand. Still keeps you in sweet slumber, your eyes rheumy. A hundred times, to teach you to get up in the morning! Note the unusual sestet, whose ‘blocks of meaning’ go 2+2+2 rather than 3+3; and whose rhyme scheme is cd cd ee instead of cce dde. Blanchemain’s version again has a number of changes, in particular normalising the sestet. His opening line is different, “Mignonne, levez-vous, vous estes paresseuse” (‘My darling, get up, you are being lazy’), but his text for the opening octet otherwise the same. I have, however, seen a different version which substitutes “frisquement” (‘coolly’) for “doucement” (‘sweetly’) in line 3. Mais le sommeil vous tient encor toute sillée. But you are still all soiled with sleep. A hundred times, to teach you to get up in the morning. A fin de vous apprendr’ à vous lever matin. In order to teach you to get up in the morning. In his second book of Amours, Ronsard allowed himself to break up the sequence of sonnets with verse in different forms – madrigals, chansons, … These are inserted (unnumbered) into the sequence – see the collection listing for the order – but for convenience I have given them a number too, showing which sonnet they come after, so that (e.g.) 6a comes after sonnet 6; and 6c is the third poem inserted between sonnets 6 and 7. I’m also experimenting with how to present a long poem with a translation. 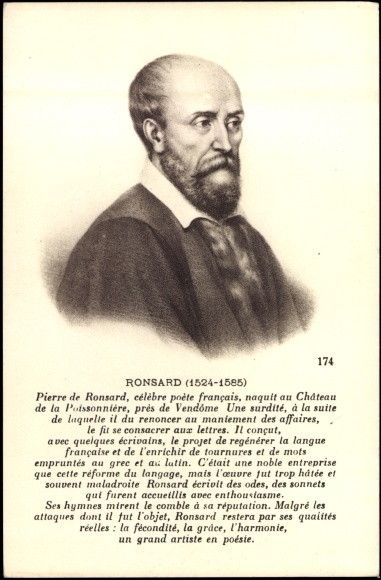 As with the sonnets, Ronsard does not leave gaps between each stanza’ of 4 lines, but he does notate the poem in sections of 4 lines. Si je chantois autrement je mourrois. Seeing that I am away from my mistress. If I sang of other things I would die. Qui de mon sein m’a desrobé le coeur. Who has stolen the heart from my bosom. Me pourroit faire au monde retourner. That light could make me return to the world. Et sans la voir j’en ay la vision. And without seeing her I have her in my sight. Tant par les yeux nos esprits sont deceus. So by our eyes our spirits are deceived. M’a vivement son portrait engravé. Has vividly engraved her portrait within me. Tousjours au coeur ce beau portrait me suit. Always this lovely portrait is there in my heart. Espars au vent en mille crespillons. Spread in the wind in thousands of little curls. Dedans la coche, et menace le blanc. And threatens the white man. Que je ne puis ny fuyr, ny souffrir. Which I can neither flee nor endure. L’autre couleur jamais ne se desteint. The other colour never fades. S’espanouyr le beau lustre vermeil. Blooming with its charming crimson tint. Ses pieds sa grève et ses coudes jumeaux. Her feet, her legs, her twin arms. M’appelle à soy pour me donner confort. Calls me to itself to give me comfort. Pour recevoir tant de formes en moy. Since I perceive her in so many shapes. Which cannot be cured with medicine. Dont le bon-heur n’est sinon que malheur. Whose good-feeling is nothing but feeling-bad. Qui me font vivre et mourir en soucy. Which make me live and die in pain. It will be no surprise that there are quite a number of adjustments in different versions. Although the changes do not affect the meaning much, Blanchemain’s version has different choices of words, different phrases, all the way through, as he presents a different stage of Ronsard’s re-working of the poem. That makes it hard to present the changes in a way that doesn’t leave you constantly referring back and forth between versions. I’ve opted for being prolix and setting out the whole poem (again!) in Blanchemain’s version, this time with the changes marked in colour. There’s an additional verse he marks with parentheses [ ] but he doesn’t offer an explanation for including it – it is clearly inferior to the surrounding verses. Et ne voit rien, car ses yeux sont deceus. M’a vivement son pourtrait engravé. Toujours à l’oeil ce beau pourtrait me suit. Que je ne puis ny fuire ny souffrir. L’autre beauté jamais ne se desteint. Et de son sein le beau lustre vermeil. Ses pieds, sa grève, et ses coudes jumeaux. Qui sans tuer nous consomment le coeur. Des visions que je raconte icy. Yet sees nothing, for his eyes are deceived. Always this lovely portrait is there to my eye. Crimped again in thousands of little curls. The other beauty never fades. Of her flushed face and of her breast. Which makes me live in terrible pain. These visions that I speak of here. Note that in this version Ronsard juggles the last three lines – only one is re-written, but the sequence changes. Now that I’ve completed the listing of poems 1-50 of the Amours book 1, I’ve put texts of them all into a Word doc for convenient one-stop downloading. Reflecting my ‘standardisation’ on Marty-Laveaux’s version, I’ve not included in this document all the alternative versions which are set out on the individual posts for each poem – just the basic text and translation.